This is an Open Project to Members of the Leviathan Project and Non-Members Alike. This World is A fun Place to Exhibit your Abilities and Observe Others Skills in hopes of inspiring your own Ideas. 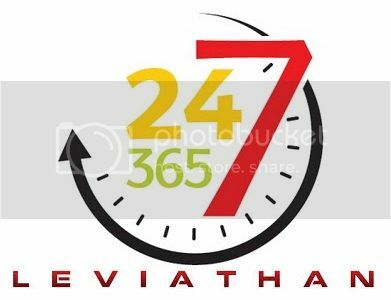 You are Welcome to Introduce yourself Here in this Dedicated Thread and also the Leviathan Forum. Future Comunications will be handled here and on the Leviathan Forum. You can Follow the Link at the Bottom to see Our Posts on the Leviathan Forum. The only thing we ask in order to be taken out of Observer Mode in World that you say Hi here so we Know that you can get any information you need here and if you have anything to share you can post it here. The Only Rules we Have on the 24/7 World is the Spawn Crater is going to become one of Leviathan's Big Projects for Welcoming Players to the World. The Bot's Tower is to be used for that Project so please don't take any of the Blocks from it. And if you See Someone is Building in an Area Please Find Another Area as there is Plenty of Room. Tearing other Players things Down is not Cool and Offensive things will be Removed. First post! Woot! Hey, my GT is Grow 42O, and my brothers is Piegoflyy. He doesn't have a forum membership, so I'll say hi for him. Hi. lol. We'll be playing on the server from time to time. Just ask if you need any help with anything. Thanks! Well, this sounds exciting! Does this mean we can build stuff on the planet ourselves, or is this just leviathen projects only? The only Leviathan "project" is what ever Bush has planned for the Tower. Otherwise, pick a spot and build. Leviathan encourages BIG builds and are comprehensively against pixel art since it has no real purpose. Bush is the host and is guiding this new project so the ultimate control rests with him. What I do know is, if you come on board, you pick an area and go for it. I think BKF wanted the spawn point left alone, too (for some future welcome center type project). You need to be on when I am playing. My Account is Always on to Host the World but that doesn't mean I am Playing. Weekends it is Hit and Miss throughout the Day. If you want to Schedule a In Between Time that we can both be around Please PM or Message me the Time so we can get you out of Observer Mode. Im sorry if you posted this before somewhere else,but is the new project for pc players or xbox players? I went and tried to poke around but could not figure out how to leave observer mode. But i did some exploring any way , and let me say, the new biomes are beautiful, and i think my favorite so far is the big flat plains... I expected to see mobs tho... They must only spawn around active players. BFK must take you out of observer mode before you can play.